by Father Junipero Serra. Its full name, which is San Antonio de Padua de los Robles means St. Anthony of Padua of the Oaks. Of all the Spanish missions in California, Mission San Antonio's surroundings have changed the least. Mission San Antonio de Padua was the first to use a red tile roof. The first European wedding in California was held at San Antonio Mission on May 16, 1773. Juan Mariu Ruiz from El Fuerte, Sonora, Mexico married Margarita de Cortona, a Salinan woman. Where Is Mission San Antonio de Padua Located? The mission is five miles northwest of the town of Jolon in Monterey County. You can get the address, hours, and directions at the Mission San Antonio Website. The statue shows Father Junipero Serra, the mission's founder. 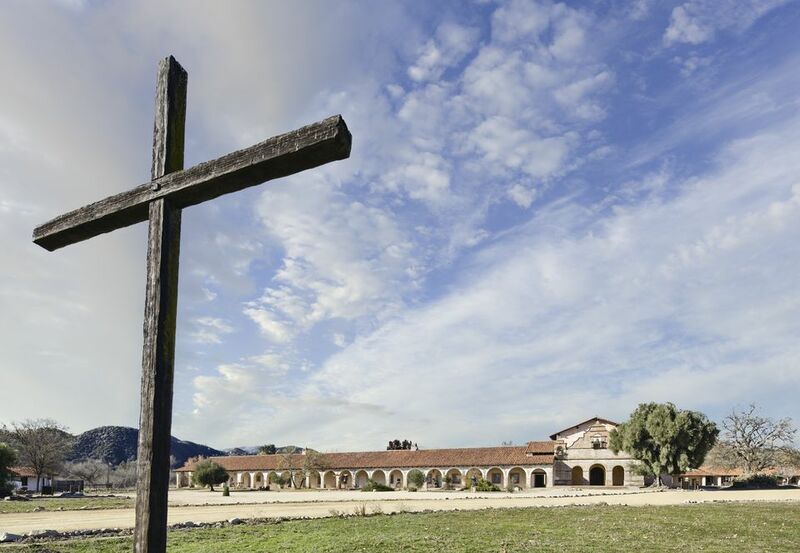 In early 1771, Spanish missionaries Father Junipero Serra, Father Pedro Font, and Father Miguel Pieras found an oak-filled valley near the coast of central California. They were looking for a site to found their third mission. They took a bronze bell from a mule's pack and tied it to the lower branch of a tree. Father Serra rang the bell and cried out: "Oh, ye Gentiles! Come to the Holy Church! Come to receive the faith of Jesus Christ!" The church that stands today was built between 1810 and 1813. The pulpit is typical for a church of the period, raised above the floor to make it easy to see. It also has a sounding board above it to reflect the priest's voice downward toward the congregation. Mission San Antonio was the first mission in California to use a red tile roof. The mud structures you see beneath the eaves are swallows' nests. After founding the mission, Father Serra left Father Pieras and Father Buenaventura Sitjar in charge. They both worked at San Antonio Mission until they died. In 1773, the Fathers moved the mission north to be near a better water supply. They built several buildings and grew corn and wheat. In 1776, San Antonio hosted the explorer de Anza on his overland trip from Mexico to California. The years between 1801 and 1805 were the mission's most prosperous. There were about 1,296 Indians working there. They spun wool and wove fabric, made leather in a tannery. They also had a carpenter shop, a stable, and a harness shop. In 1804, Fathers Sancho and Cabot arrived. The Valley of the Oaks is very dry. To be sure the mission had water, Father Sitjar had a dam built across the river in the mountains. A brick-lined channel brought water down to the buildings and to the fields. A water-powered mill was also built in 1806. Father Sitjar died in 1808. By 1827, San Antonio Mission had more than 7,362 cattle, 11,000 sheep, 500 mares and colts, and 300 tamed horses. Harvests were plentiful, and they made wine and baskets. In 1834, Mexico decided to end the mission system and sell the land. The Indians could not care for San Antonio Mission by themselves, and their population dwindled to only 140 in 1841. In 1845, the property was valued at 8,269 reales, but by 1846 its value had declined to 35 reales. No one wanted to buy it, so the Mexican governor sent a Mexican priest, Father Ambris, to take care of it. He tried to take care of the buildings, but when he died in 1882, the structures were abandoned. San Antonio Mission sits today near Fort Hunter-Liggett. Thanks to its remoteness and the fact that the surrounding land only had three owners in its history, its surroundings are almost unchanged since 1771. By the time of the first written records at Mission San Antonio de Padua, the first buildings were completed. In 1776, they put a mortar and tile roof on their building (the first in California) and completed adobe buildings for the neophytes. There were also storerooms, barracks, warehouses, and shops, and an irrigation ditch carried water to the fields from the river. In 1779-1980, a new church was built. It was 133 feet long. The first horizontal-powered water mill in California was built in the early 1800s, and another new church was completed in 1813. Heavy rains came in 1825, which led to many buildings collapsing. They were later replaced by new, stronger ones. After Father Ambris died in 1882, the church statues were moved to Mission San Miguel for safe-keeping. The buildings were abandoned. An antique dealer stripped off the tile roof and sold the tiles for use on a railroad station. The adobe walls began to deteriorate. Efforts to restore the church started in 1903, but the 1906 earthquake damaged it beyond repair. Eventually, only a few arches were left. The Franciscan priests returned in 1940 and began to rebuild the church. With the assistance of the Hearst Foundation, Mission San Antonio was reconstructed. They used mud from the crumbled walls and original tools to make the new adobe bricks. 1774, the date of the first records, San Antonio Mission was doing well. They had 178 Indian neophytes, 68 cattle, and 7 horses. The Mission picture above shows the Mission San Antonio cattle brand. It was drawn from samples on display at Mission San Francisco Solano and Mission San Antonio.